CAJOMA PHINISI III was constructed in 2014, a classic style of Phinisi Boat which was built by the local people using Iron Wood for base and Hard Teak Wood for upper structure. With the size 30 m length and 5 m width, the CAJOMA PHINISI III has two ship’s mast. 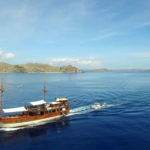 Nataraja Liveaboard is an elegant Phinisi Yacht cruising the Indonesian Archipelago from Komodo to Raja Ampat and beyond. Wisesa is our new Boat built in 2015/2016 for liveaboard cruises in Indonesia. We designed a strong and safe vessel, a mix between modern comfort and charm of a wooden boat. His name “Wisesa” means the power of Nature in the Hindu religion, we think that Wisesa is the link between us and Mother Nature. 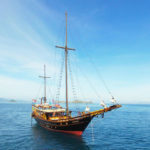 Entirely made of wood in the traditional Indonesian style, the 22-meter long Wellenreng is both pleasing to the eye and offers lots of room, a beautiful interior and the most modern equipment for your comfort. The average cruising speed is seven knots. 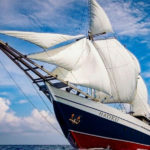 The Tidak Apa’Pa is a traditional Indonesian boat, released in 2001 from Tanah Biru shipyards in South Sulawesi, flagship of the shipbuilding industry, where it would return every year for maintenance and improvements. 100% made of wood, with a characteristic Banana shape, 2 masts and 7 sails, this Phinisi sizes 21m long and 5,5m wide, and has a maximal capacity of 8 persons in 4 double beds. A 30m wood hull traditional Phinisi boat, 4 double cabins accommodate up to 8 guests on this spacious vessel. 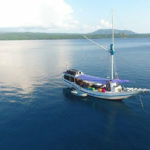 With only 4 cabins 2 on the upper and 2 on the lower deck there is lots of space and individuality for less divers, the only liveaboard currently operating exclusively in Lembeh and Sangihe Islands. Sahaung Island – White sandy beach, a family-like atmosphere and individual dive experiences in small dive groups awaiting you at our small island Sahaung in Bangka. The Mikumba II is unique in its class and build in the fact that it not only comprises of two double, en suite, master cabins, but also includes the largest deck space of any Phinisi for this length. Mikumba II also has a fully functioning transom swim/dive platform which again is unique to this vessel within the Phinisi builds. 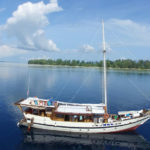 The Maluku Explorer (a.k.a Liburan Paradise Liveaboard) is belongs to Extra Divers Worldwide and one and only Liveaboard that run diving at Halmahera. 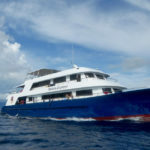 Maluku Explorer was built from divers for divers so it’s spacious compare to other liveaboard you may know and provides different kinds of rooms. All nine cabins are equipped with air conditioning and bathroom with shower. The dive deck is very spacious (45 sqm) and also provides a huge camera table for photographers and charging stations. On the dive deck there are 2 showers outside. 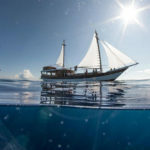 Kira Kira is a 22 meter long Phinisi, boasting four cabins and a communal dining area, a covered dive deck and large sun area 4.5 meter wide, with two teak masts and a Ketch Cutter sail rig. She motors at 7 – 8 knots and sails with the wind. 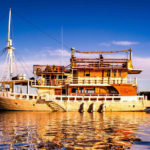 A classic Indonesian Phinisi built from handpicked Teak and Iron Wood, in Kendari, South Sulawesi and given a modern makeover in design and facilities to make this one of the most comfortable and stylish liveaboard now operating in Indonesia. At 38m long and 9.3m wide she is a spacious vessel and has been finished with an attention to detail. The Hatiku provides ample room in its 6 double cabins, generous deck space and communal areas for up to 12 divers. Fitted out with all the latest safety, technical and entertainment equipment she combines old world style with modern amenities to deliver a truly outstanding vessel to the discerning diver.